Hawkeye Family Dental provides comprehensive dental care to patients in Delhi, CA, Hilmar, CA, Turlock, CA, and the surrounding areas. If you are looking for a dentist to restore one or more missing teeth or stabilize dentures, we offer dental implants to provide a more permanent solution for missing teeth. 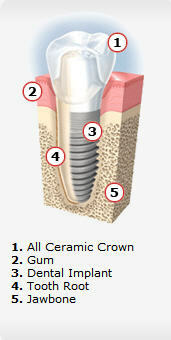 Dental implants are small screws made of titanium that are implanted into the jaw and used to anchor replacement teeth. Implants are useful for one or more missing teeth. Dental implants replace the root structure of the natural teeth, which prevents shrinkage of the jawbone and preserves the adjacent natural teeth. Dental Implants improve the appearance, feel, and function of the teeth, so you are better able to eat, speak, and smile. Several factors influence the cost of dental implants, such as the number of missing teeth and any other procedures that are needed. Please contact our office for a diagnostic examination by our dentist to determine if you are a candidate for dental implants, get treatment recommendations, and a free estimate for dental implants. Advances in surgical techniques enable a qualified dentist to place dental implants in a single session with keyhole surgery. This innovative method requires minimal manipulation of the soft tissue, which reduces discomfort and healing time. The level of discomfort will vary, depending on the individual patient’s response to pain and the number of dental implants that will be placed, but anesthesia and sedation options are available. There will be a bit of swelling and bruising after dental implants are placed. In most cases, the discomfort can be treated with an ordinary painkiller, which can be prescribed by the dentist. The replacement teeth need to be brushed, flossed and examined regularly, just like your natural teeth. You should continue to visit the dentist at least once every six months. Contact our Turlock, CA dental implant office for more details today! You may also schedule a consultation with our office using our online appointment request form.